Jerry Hutcheson was born on May 18, 1923, in Chicago, Illinois. He enlisted in the U.S. Army Reserve on December 14, 1942, and went on active duty as an Aviation Cadet in the U.S. Army Air Forces on February 26, 1943. 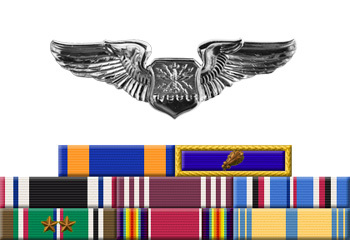 Hutcheson was awarded his Navigator Wings and was commissioned a 2d Lt at Selman Field, Louisiana, on April 8, 1944, and deployed to England as a B-17 Flying Fortress Navigator with the 100th Bomb Group in England in July 1944. Lt Hutcheson flew 8 combat missions before being forced to bail out over Germany and taken as a Prisoner of War on September 11, 1944. After spending 237 days in captivity, he was repatriated by the Soviet Army on May 5, 1945, and returned to the U.S. in June 1945. Lt Hutcheson received an honorable discharge from active duty on January 4, 1946, and from the Air Force Reserve on June 6, 1955. After leaving active duty, Jerry completed his bachelor's degree in engineering and later received his master's degree in astronomy from the University of California. He worked in Germany as an Air Force contractor in the rebuilding effort there in the 1950's and in the aerospace industry as an aeronautical engineer and as an astro-physicist with the RAND Corporation for many years. 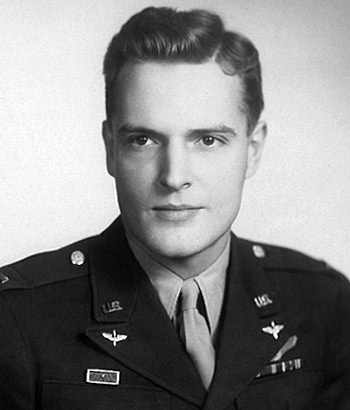 Jerry Hutcheson died on May 7, 2009, and his ashes were buried at Arlington National Cemetery.